Coworking space is a new workspace trend in most metropolitan cities including Dubai. They are growing both in number and popularity. Now you hear so many of your freelancing friends telling you great things about their coworking space, the environment, the “feel”, the people, and just about everything in there. And you might be wondering what is a coworking space? I will cover the basics and benefits of co-working spaces in Dubai and whether you should look for one yourself. Coworking space is the contemporary form of a shared office. Many entrepreneurs and freelancers who want to work from an office instead of their homes, choose to share an office space. Since they can’t usually afford (and don’t even need) to rent an entire office of their own, coworking space offers a beneficial alternative. They can share an office with other freelancers. A coworking space is a café-like office where people from different industries and professions share one office space. Usually, coworking spaces are shared by professionals from the same industry, but that is slowly changing to coworkers from multiple industries to engage, network, and learn about new opportunities. In a coworking space, you’ll find a number of professionals working in the same office space. For freelancers, who work alone and don’t have the opportunity to network with other professionals, coworking spaces offer them the chance to meet and learn from other workers. When you are working in the same office and meet every day, you get to talk and socialize with other freelancers and develop more connections. In the freelancing industry, that’s a crucial factor for retaining more work. What is a coworking space if it doesn’t allow you to work together with other professionals on the same projects. Before coworking spaces became a thing, freelancers worked from their home. If you worked freelance, you probably know how boring that can be; i.e. long working hours without anyone to share or discuss your work with. Coworking spaces create a sense of community for these remote workers. If you are having problems with a certain task, you can discuss your problems and help each other out. Most coworking spaces are designed and maintained by service office providers. When designing these space, the providers kept in mind a certain profession or a company. This helps them attract the right professionals. You will find most coworking offices to be very creative. This inspires coworkers to be more productive, creative, and all around happier. 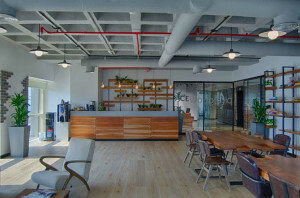 In both cases, the coworking space provider is responsible for maintaining the office. Most coworking spaces come stocked with supplies. You get access to high-speed internet, printers, other telecommunication devices, meeting rooms, plus a stocked kitchen. This means you can concentrate on your work and experience higher productivity. Is Coworking space for me? Coworking space is for you if you don’t want to sit alone at home, doing your work. You might want to talk to other professionals and grow your understanding of the profession. You might even get extra work through collaborations in a coworking space rather than work alone at home. Coworking spaces work best for extroverts or introverts who like to bounce their ideas with others. Coworking space is also an option for small teams. Setting up an office at one member’s home can’t be a long-term solution for your team. It disrupts your team member’s family and creates friction in the team. With a coworking space, all members can meet at one office, without having to set up a proper office. If you are just starting up or you are working on a project with a team, a coworking space offers you a place to meet, plan and work together. If you are looking for a coworking space in Dubai, talk to us at www.fluidmeet.com. We have coworking spaces in the best locations, suited for a number of professionals. Previous PostShould I go for the big serviced office providers or local ones? Next PostWhat’s the difference between a banquet hall, meeting room, and event space?